Tuesday –Friday, 12:01 a.m. –5:00 a.m.
Saturday, 1:00 a.m. –6:00 a.m. 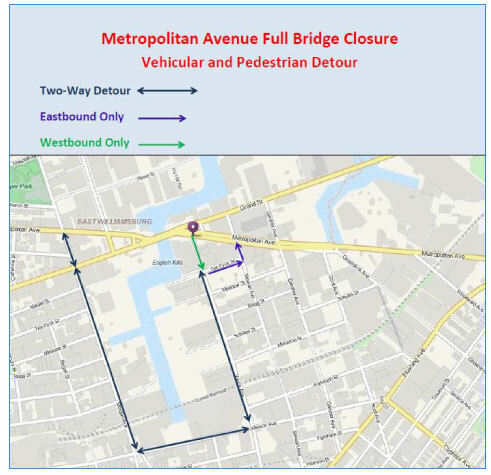 In the early morning hours beginning June 9, 2015, the New York City Department of Transportation Division of Bridges will perform overnight closures on the Metropolitan Avenue Bridge over English Kills for five consecutive nights inorder to replace operating machinery that was damaged during Super Storm Sandy. The closure affects vehicular, pedestrian and bicycle traffic including the Q54 Metropolitan Avenue Bus. Please refer to the detour map below for the temporary route. Detour signs will be posted to assist motorists around the closure. Community Liaison Nancy Catapano is available to provide information about this project at 718-869-1428, MetroSandyBridgeFix@gmail.com or https://www.facebook.com/metrosandybridge. For all NYC non-emergency services, including inquiries regarding NYCDOT construction projects, dial 311. Be prepared to give your name, the borough of the project, and a return phone number.